Pope Francis I will hold eight official titles during his time as the leader of the Catholic Church, and none of them will be "Pope." Pope Francis I will be taking on the awesome responsibility of leading a church with more than 1 billion followers, a job that comes with eight official titles — none of them "Pope." To hear Dr. Terrence W. Tilley, Chair of the Theology Department at Fordham University, tell it, calling the pope "pope" is a little like calling your CEO "chief." "'Pope' comes from the Italian 'papa,'" explains Tilley. "It's actually a colloquial term rather than a formal term. In America, we often use the phrase, especially the bishops — 'Holy Father,' 'Sancta Papa,' — which is where you get 'Pope.'" The pope's proper title, according to the Vatican's website, is Bishop of Rome, Vicar of Jesus Christ, Successor of the Prince of the Apostles, Supreme Pontiff of the Universal Church, Primate of Italy, Archbishop and Metropolitan of the Roman Province, Sovereign of the State of Vatican City, Servant of the Servants of God. "Bishop" comes from the Greek "episcopas," meaning "overseer," and Rome of course being HQ for the Catholic Church. 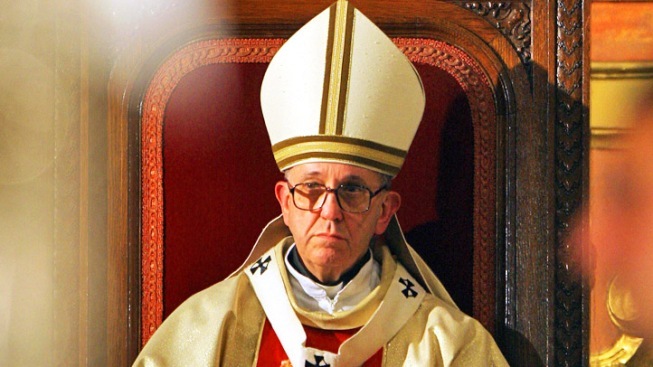 The term "pope," or "papa," didn’t emerge until later. St. Peter is considered by many to be the first Bishop of Rome, but Father Raymond Schroth of America Magazine says there is a fair amount of doubt surrounding that claim. "Raymond Brown was the best scripture scholar we had, and he's written several things on this. (He) said it would be a mistake to say that Peter was the first pope, as if he were the founder of the church. That's an exaggeration. The evidence for Peter's presence in Rome is not airtight — that's a nice way of putting it. They have a tomb under St. Peter's Basilica in Rome, where it's believed that St. Peter is buried. But, you know, it took 'em a long time to find the grave," says Schroth with a laugh. "A less formal title that is rooted in his primacy," says Tilley. "That is, his political headship of the universal church. So a vicar would be something like a vice regent. I believe it is a medieval or early modern title." Another direct reference to St. Peter, who was deemed Prince of the Apostles on the strength of Jesus declaring in Matthew 16:18, "That thou art Peter, and upon this rock I will build my church." Another dubious claim, according to Schroth. "Historically, this is a stretch, in the sense that the evidence is not there that Peter was the first leader of the church," says Schroth. "If you said to Peter, if you were to flash back in history and say, 'Are you the pope?,' he wouldn’t know what you were talking about. That term 'pope' did not come along for another couple hundred of years. "This is a baroque title. It's one of those 'let's puff up the pope' titles," concedes Tilley. 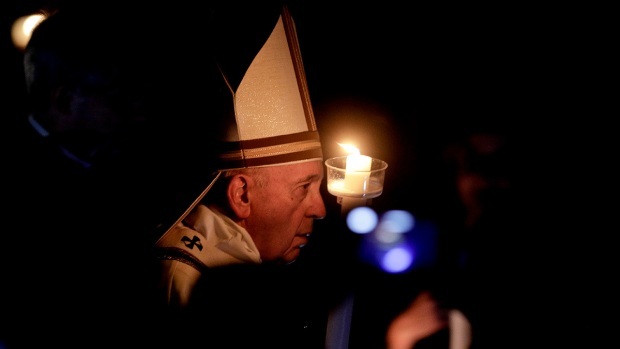 The word "pontiff" comes from the Latin "pontifex," meaning "bridge-builder." "Pontifex maximus" was the great bridge-builder of ancient Rome, a title held by the likes of Julius Caesar. Tilley believes the title was assumed by the Bishop of Rome post-Reformation, as an assertion of his "juridical and communicative status." "More hierarchical jargon that keeps emphasizing that he's the number one guy," says Schroth. "What I think is implied (by Universal) is that this includes the Greek Catholic Church — not the Orthodox — as well as the Roman Catholic. They don’t call themselves Roman Catholics, but they are Catholics, and they acknowledge the sovereignty of the Bishop of Rome... It's power talk." Nothing to do with monkeys. Like with any massive bureaucracy, the Catholic Church has layer upon layer of jurisdictions, and this title affirms the pope's status among the other bishops in his home country. "A 'primate' is the head — or the 'primus,' the first one — of a region of the world. So the 'primate of Italy' says that he is the first in line of the Italian bishops," says Tilley. "As primate of Italy, he is the number one bishop of Italy... So when the Italian cardinals meet, he would be in charge of the cardinals." Yet another layer. The universal church is divided into regions, for which there are primates, and then the diocese, for which there is the "archbishop and metropolitan" (in this instance "metropolitan" is a noun, not an adjective) — think Cardinal Timothy Dolan of New York. "He's a king! He's a king of 29 acres," says Tilley. "In previous centuries, the pope was the sovereign of the papal states, so they had political jurisdiction over much of central Italy." Following the unification of Italy in 1870, Vatican City's status — "The Roman Question" — was up in the air until the Lateran Treaty of 1929 established it as a sovereign state within Benito Mussolini's Italy. From the Latin "Servus servorum Dei" and rooted in Matthew 20:26-27, which says, "whosoever will be great among you, let him be your minister; And whosoever will be chief among you, let him be your servant." "That's a great title, because it's the most biblical — it's probably the only biblical one," says Schroth. "At the Last Supper, Jesus gets down on his knees and washes the feet of the 12. He's saying, 'I'm trying to show you something: you're servants.' And there are plenty of these little incidents in the Gospels. "The apostles think this is a power trip. They think Jesus is going to be made king or messiah or have some earthly power. And they want jobs in the administration. One guy sends his mother, the mother of James and John, and she says to Jesus, 'Take care of my boys when you come into power.' And he says, 'We'll see how well they take persecution.' The apostles are not perfect in that they have certain ambitions, and he's trying, up to the very end, to teach them to get over it."